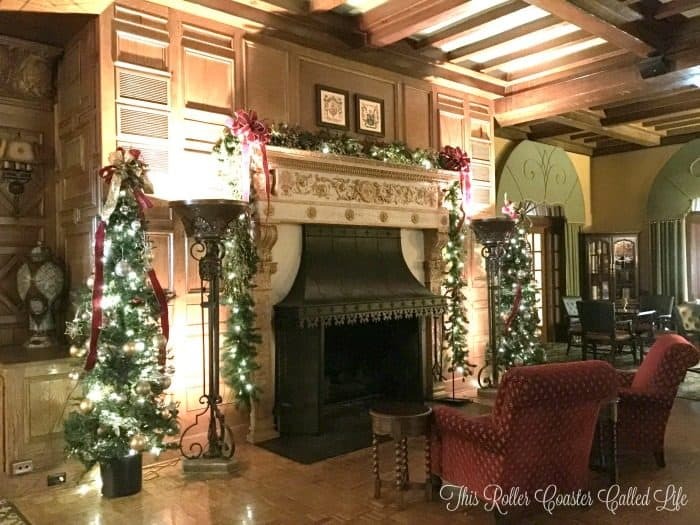 Recently, my family and I had the opportunity to stay at The Hotel Hershey and visit Christmas Candylane at Hersheypark. 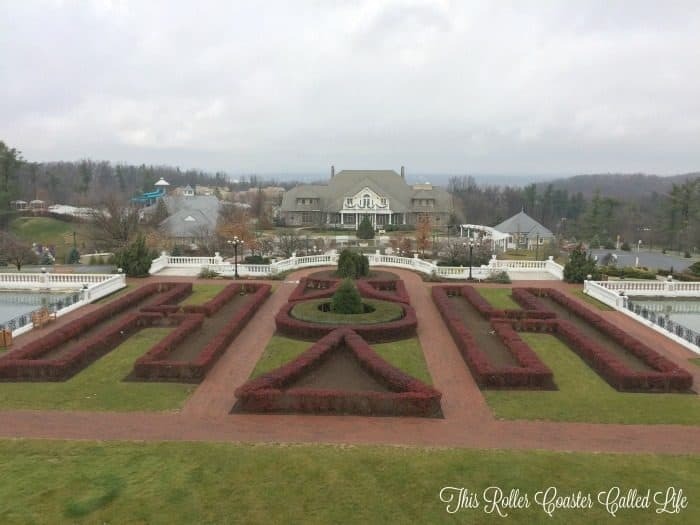 We have been to The Hotel Hershey several times to eat, shop, and wander through the gardens. While we have stayed at the hotel once before, it is also a place that we enjoy going to and just hanging out. 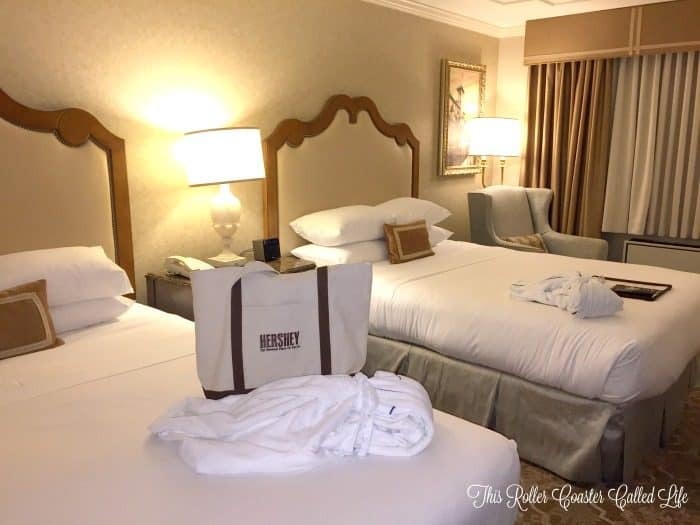 [FTC disclosure – Our stay at The Hotel Hershey was comped as part of the Sweetest Moms. All opinions are 100% ours.] 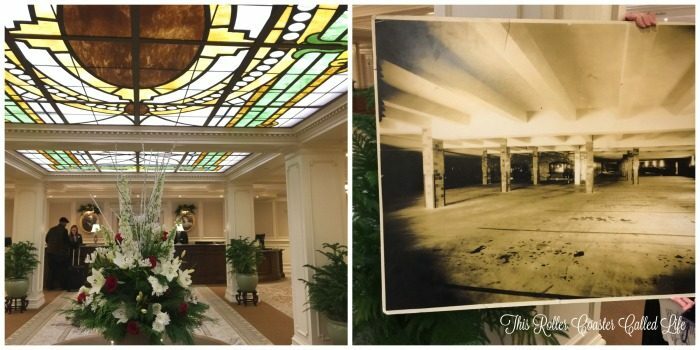 Now, that the disclosure is out of the way, let’s talk about The Hotel Hershey! The Hotel Hershey is an historic hotel that opened in 1933. As a family of history fanatics, we love watching the biography of Milton Hershey on the hotel TV. Milton Hershey did so much for the area during the depression. He started and completed building projects, including The Hotel Hershey, to keep the townsfolk working through the depression. The Hotel Hershey is a lasting monument to his fortitude. If you are looking for a luxury destination in Hershey, PA, look no further than The Hotel Hershey. The Hotel Hershey is a recipient of both the Forbes Four-Star Award and the AAA Four-Diamond Award. 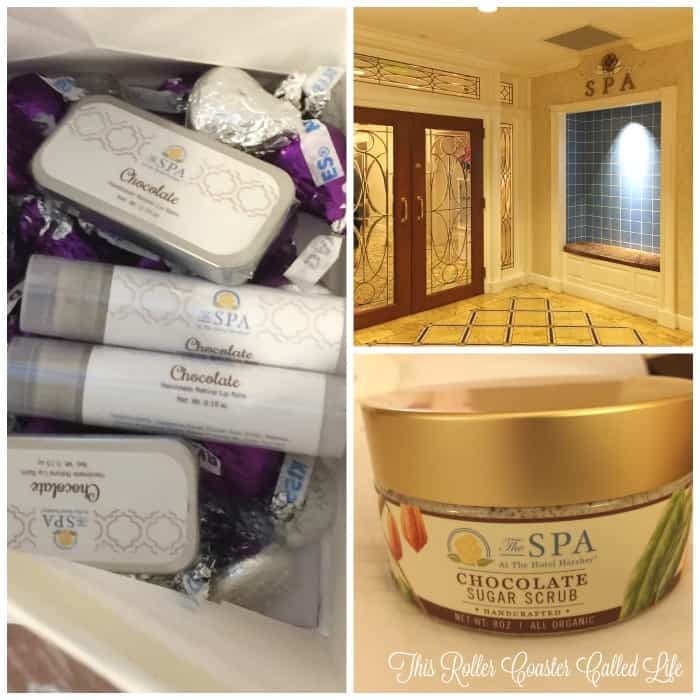 If you want to be pampered during your stay, check out The Spa at The Hotel Hershey, aka the Chocolate Spa. Definitely make your reservations for the Chocolate Spa early as I hear they often are booked up. Songbird and I like to stop by and pick up our lip balm at the Chocolate Spa. Definitely a favorite! When we arrived, we entered the registration area. I love the feeling of this area. It has just the right welcoming vibe mixed in with an opulent feeling. I love the rooms at The Hotel Hershey! This year, we stayed in a different area than we did last year, so the room had a little different layout. But, it was still filled with that old-style charm. I also love the vintage charm in these rooms. Just look at that built-in on the right! This would be the perfect place to stay two or three days and visit attractions in the area. The food options at The Hotel Hershey are varied. We enjoy eating at trevi 5. It has a nice eclectic mix of dishes, and the menu is always changing. For breakfast, we chose to opt for room service. 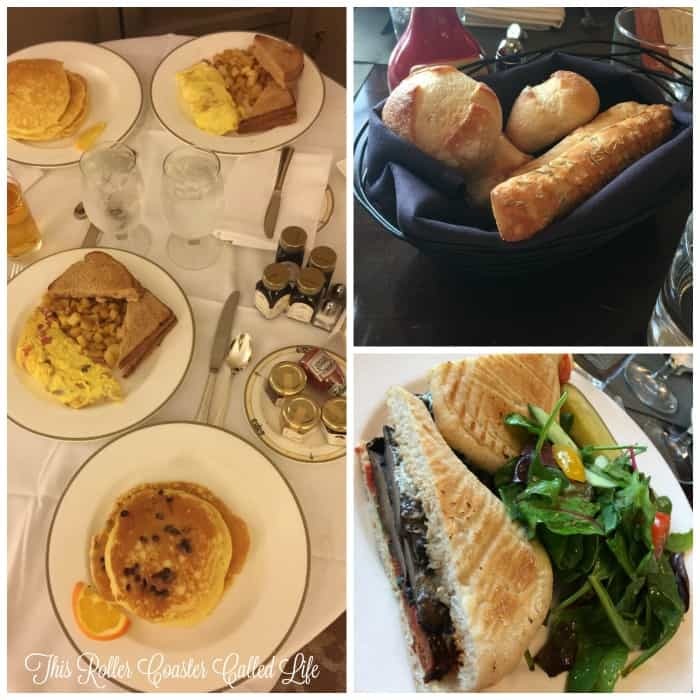 This has become a favorite routine of ours at Hershey as we are able to avoid the rush at the restaurants in the morning and have a leisurely breakfast on our timeframe. 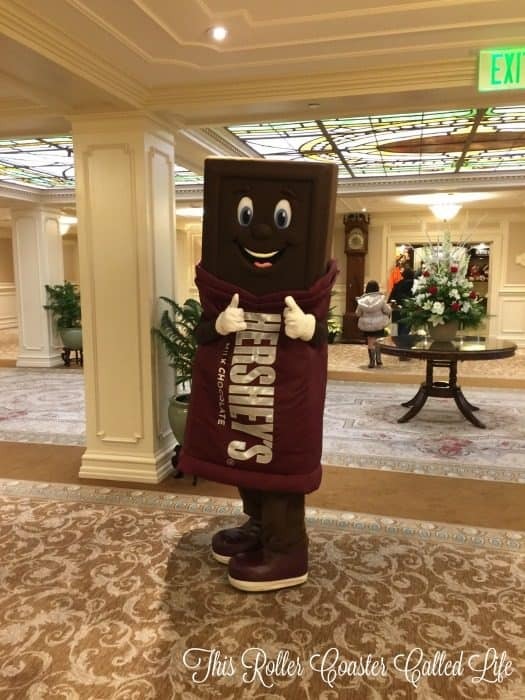 Of course, if you are looking for sweets, The Hotel Hershey can certainly offer that! On the left is the case at Sweets. 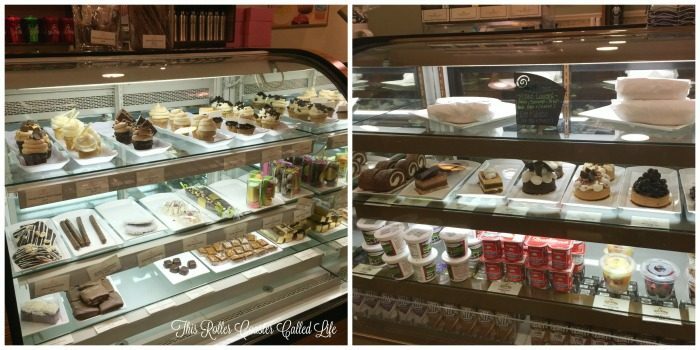 There are so many great desserts there, plus they have “decorate your own” cupcakes. The case on the left is from the Cocoa Beanery. The Cocoa Beanery offers snacks and coffee. 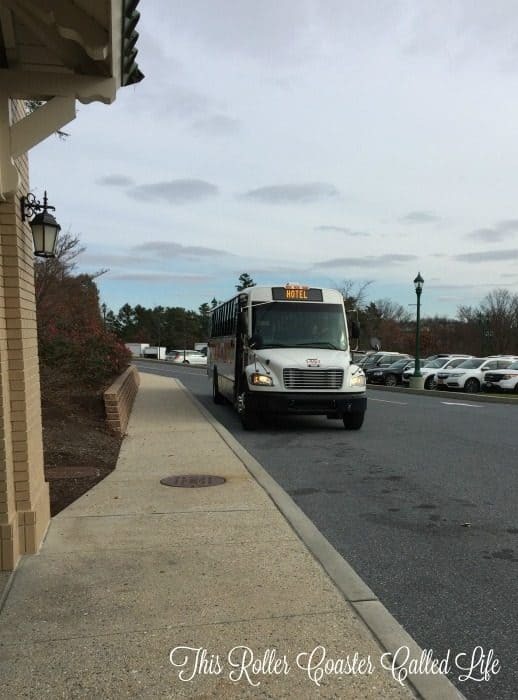 One of the great perks of staying at one of the Hershey resorts when Hersheypark is open is the bus transportation! 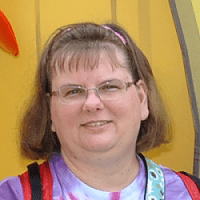 I don’t have to drive over and park… I can just hop on the bus and ride over to the park. The bus lets us off near the entrance of the park between the park and Chocolate World, so it’s easy to run over to Chocolate World to pick up some goodies to take back home. I mentioned history earlier… Registration originally occurred in the Fountain Lobby. Registration now occurs one floor down, but the Fountain Lobby was refurbished in 1998 to its former glory. 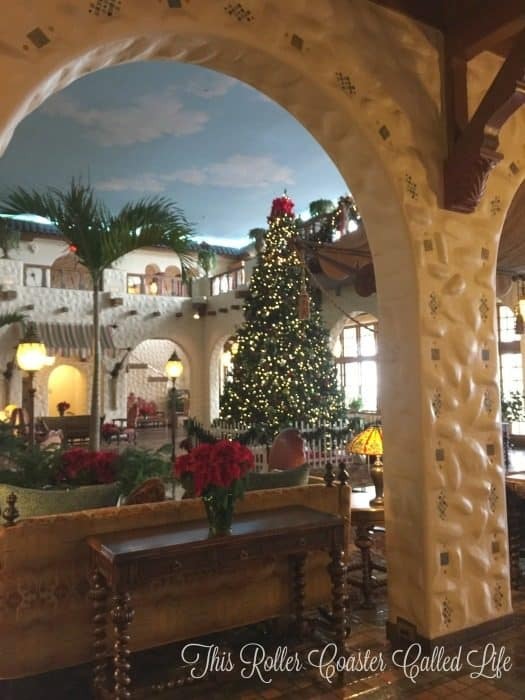 A couple of the restaurants and the lounge are located off the Fountain Lobby, and the kids and I will often find ourselves wondering out to the lobby and plopping down in one of the comfortable chairs. It’s a nice place to visit or just to read. Remember the picture of the registration area? What is now a beautiful space was once the parking garage. It’s kind of hard to believe, isn’t it?! We had the chance to tour a few rooms that normally aren’t open to everyone. This is the Iberian Lounge. It is open to guests; however, the kids wouldn’t normally have the chance to go inside. There is a painting over the bar that with a path that seemed to face me no matter what side of the bar I was on. If you are interested in some of the history of The Hotel Hershey, head over to the Hershey Archives to find out more! Our tour guide was so knowledgeable! 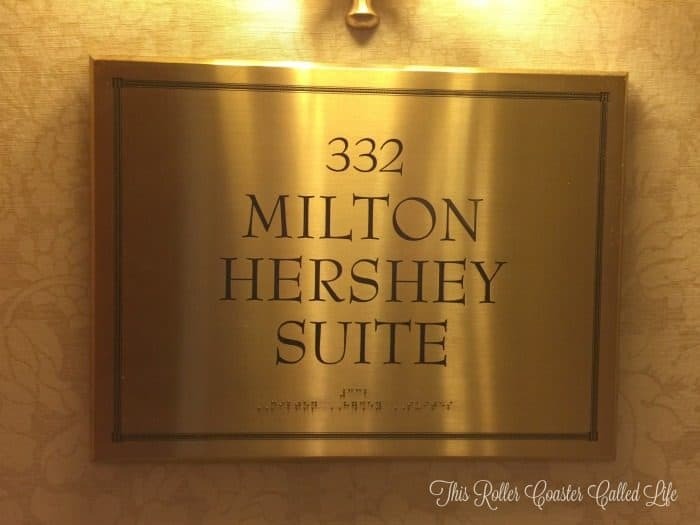 We also had the chance to tour the Milton Hershey Suite. 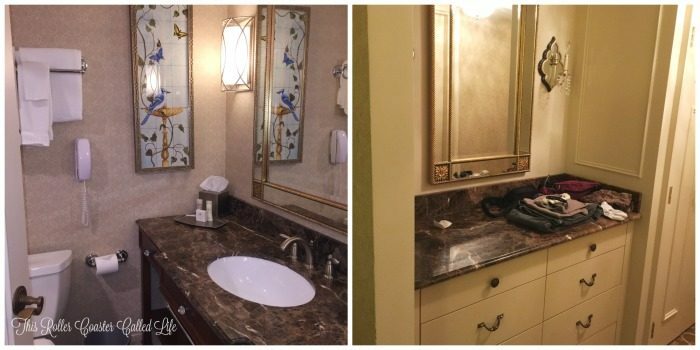 If you have the opportunity to book this suite, you are in for a special treat! It has lots of indoor space and outdoor space! The balcony/patio looks out over the front of the hotel and down toward the park. It has two bedrooms, 2 1/2 baths, and a small dining area. There is also plenty of indoor living space to entertain in, as well! It is out of my budget, but a girl can dream, right? 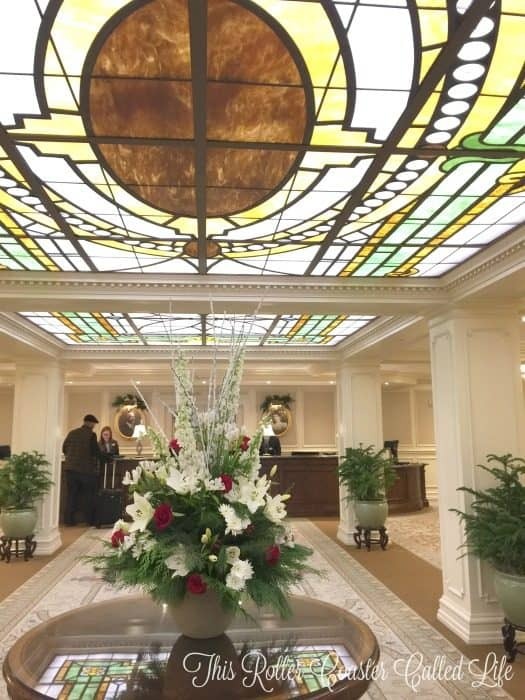 There are just so many things to love about The Hotel Hershey! 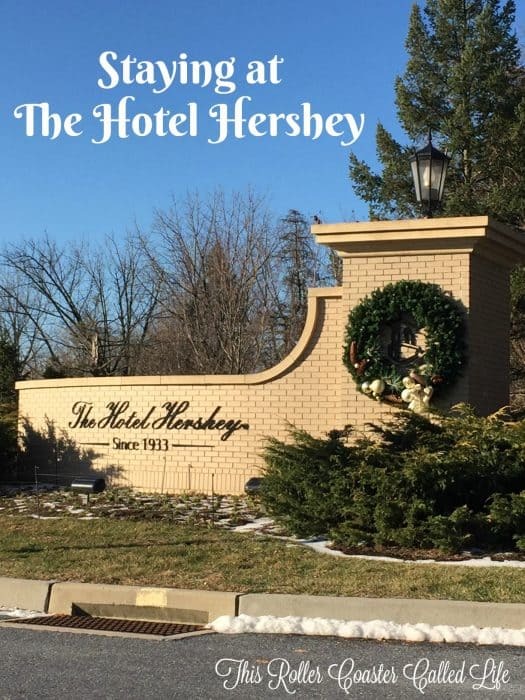 Whether it be the great food, the Chocolate Spa, the rooms, the gardens, or just the atmosphere, The Hotel Hershey is a great place to stay when traveling to Hershey, PA! Disclosure: My family and I stayed for free at The Hotel Hershey as part of the Sweetest Moms. 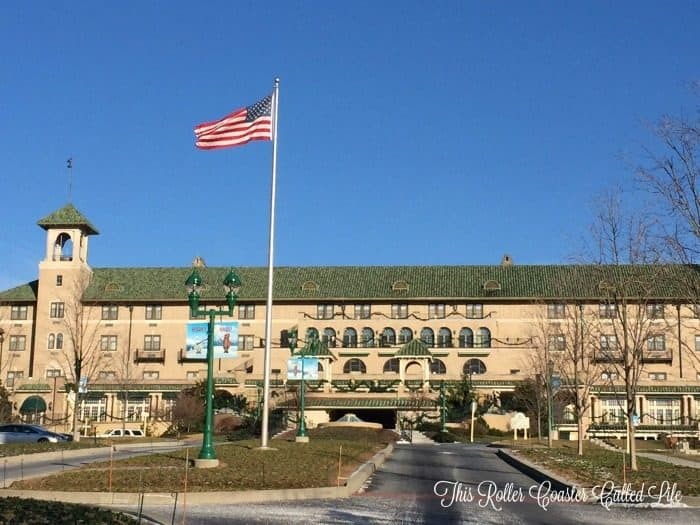 We always love going to The Hotel Hershey, and all opinions of our stay there are ours and are not influenced by others. 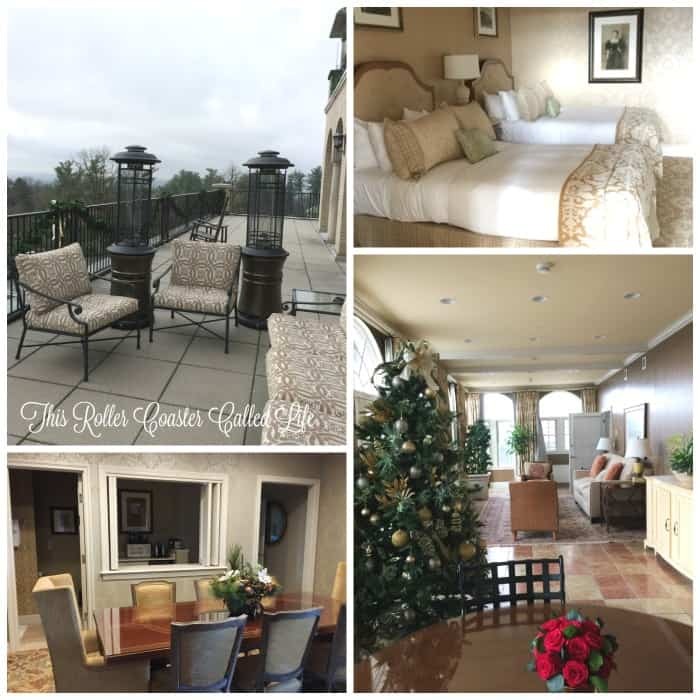 We travel to Hershey frequently and love to stop off even when we are not staying there. I would love to stay here, it is just beautiful and not too far away from me. Now this looks like a fun stay! Thanks for sharing! This is one my list of places I want to visit one day! Oh wow, that looks so nice! I love how they did the bushes outside like the kisses! Would be so fun to stay there! This is so amazing! I would love to go here someday! This looks like a wonderful vacation get-away! I would love to visit Hotel Hershey just for the chocolate atmosphere! It looks absolutely divine! I would love to go just for the food.